Growing up in the 80's I had a real love for the all-star formula comedies of the era, gathering together large ensemble casts for farce and larks was just good fun, from the scavenger hunt movie to the road-trip races there were plenty of formulaic farces to love and Cannoball Run was one of my youthful favorites, anytime it was airing on TV I would throw myself onto the couch and give it a spin. This sequel is a lot of fun, stuntman turned director Hal Needham (Smokey and the Bandit) got the band back together minus the considerable charms of Sir Roger Moore (Moonraker), but this is more or less a repeat of the first film, we begin with Sheik Abdul ben Falafel (Jamie Farr, Clinger from M*A*S*H) who lost the first race being forced by his by his father (Ricardo Montalban, Star Trek: The Wrath of Khan) to hold another Cannonball Run, and the teams of racers assemble once again and make their way across the U.S. in hopes of winning the big prize money - there's really nothing more to it than that! JJ Mclure (Burt Reynolds, Boogie Nights) and Victor (Dom DeLuise, Blazing Saddles) return, since the first film they've been working as part of a aerial stunt crew, including a hair-raising human missile gag we get to witness go awry just before they disguise themselves as military men and join in on the race, along the way hooking up with a pair of women disguised as nuns, Betty (Marilu Henner, TV's Taxi) and Veronica (Shirley MacLaine, Two Mules for Sister Sara), who believe the military men are about to become wealthy after overhearing a conversation out of context. Rat Packers Blake (Dean Martin) and Fenderbaum (Sammy Davis Jr.) show up, this time on the run from mobster Don Don Canneloni (Charles Nelson Reilly, Rock-a-Doodle), who sends his enforcers after them, the enforcers include The Godfather alum Alex Rocco, Abe Vigoda and Michael V. Gazzo in addition to Henry Silvia (Probability Zero). Meanwhile Don Don is in deep with another mobster, Hymie Kaplan (Telly Savalas, Lisa and the Devil). Other entrants in the race include "two great-looking chicks", that being Jill Rivers (Susan Anton, TV's Baywatch) and Marcie Thatcher (Catherine Bach, TV's Dukes of Hazard) the latter of whom while not wearing her signature Daisy Duke cut-off shorts is still a tall-order of sexiness. We also get Jackie Chan (Drunken Master), teamed up with 007 villain Richard Kiel (The Spy Who Loved Me) in a hi-tech Mitsubishi Starion that can levitate! Oh yeah, there's also a orangutan that loves to pretend to drive cars and flip old ladies the bird, what's not to love? Sure, the story is fairly rote, it's a carbon copy of the first film which was threadbare in the story department, but on the plus side we have lots 70/80's of celebrities crammed into this one in various cars making fools of themselves and clearly having a cocaine-fueled (I'm assuming) blast. 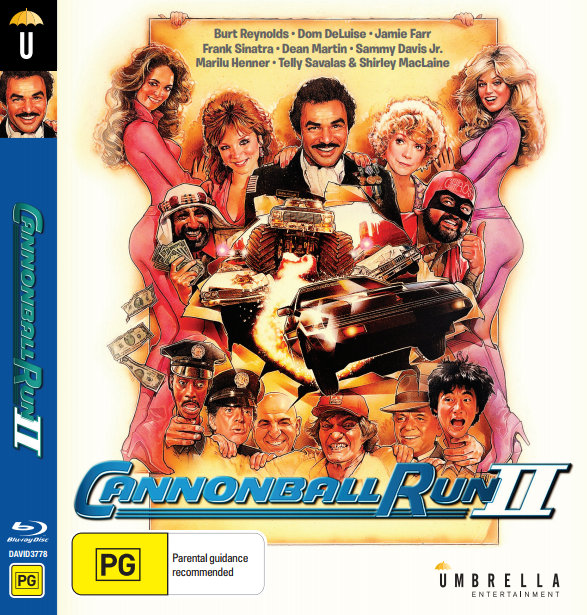 Audio/Video: Cannonball Run II (1984) arrives on region-FREE Blu-ray from Australia's Umbrella Entertainment in 1080p HD framed at 1.78:1 widescreen, looking to be dated from an older HD master the image is somewhat soft and lacks the depth that a newer HD master might have provided, but the source looks to be in good shape with only some minor white speckling. Colors are nicely saturated and the black levels look good. The only audio option is a lossy Dolby Digital stereo track with optional English subtitles, it does the job just fine, everything comes through clean and well-balanced, I just miss the fidelity boost we could have gotten with a lossless audio option. The disc is barebones, there are no extras - not even a trailer for the movie - not even a start-up menu for this one. The single-disc Blu-ray release comes housed in the usual over-sized 16mm spine Blu-ray keepcase with a sleeve of reversible artwork featuring the original key-art by iconic movie poster illustrator Drew Struzan, the reverse side features a variant of the same key artwork minus the rating label. Also, good news, this release is region-free! If you're a fan of 80's comedies, scavenger hunt movies like Rat Race (2001) or just fun road race movies like The Gumball Rally (1969) there's a lot to enjoy about this Cannonball Run entry, it's just a fun 80's screwball comedy.